Expedition members: Ashley Gregg, Jacob Podesta, James Vallins, Simon Hadfield, Rory Colville, Chris Burnley, Tom Crowther. Towards the end of the summer break of 2016, a group of seven members of the UBSS travelled to County Clare on our annual Ireland expedition. 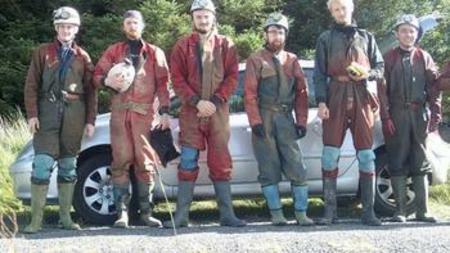 Our main objective was to continue our surveying work from the year before in the Coolagh River Cave. Unfortunately, due to exceptionally wet weather conditions this plan was not possible (as we would have drowned), and so instead we worked on several smaller surveying projects in the area. In our first week we focused on Cullaun Zero cave, which consists of one crawl-sized stream passage, with multiple entrances. We made good progress, with access to the deeper section of the cave blocked by a fragile straw formation. In addition to this we surveyed the nearby, small Cullaun Zero-One cave, which I believe Jacob and James will be glad never to have to go back to. Through the second week work began in Cullaun One – a much larger cave in the same region, in order to update previous work done by the UBSS dating back to 1951. We surveyed 1.8km of passage, however there is much more still left to do. From the main entrance one team worked downstream in mostly walking-size passage, with an occasional waterfall and multiple oxbows. This continued to a protracted wet crawl, alongside many pretty formations, and continues on. Another team surveyed upstream through winding passages, and past several more entrances to the cave. 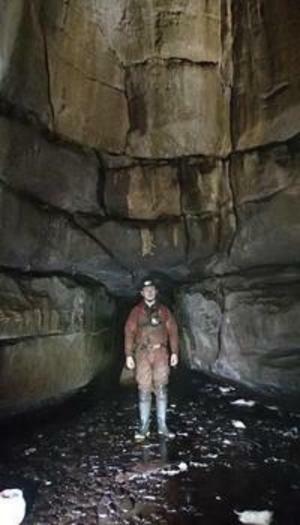 In addition to these projects, we also surveyed Carran Mine Cave. This consists of a former lead mine which intersects with a natural bedding plane – in which we discovered a near complete badger skeleton. Although we did have to survey a rather scrotty crawl after sending Simon down it as a joke. Unfortunately, it went. Of course it wasn’t just surveying (generally whilst lying in a steamway) that we got up to. There were many evenings of beer drinking, board and card games, and generally having a laugh. There were also many other entertaining moments, such as the time Tom and I spent sat in a bothy bag by the side of the road waiting for our lift to turn up. 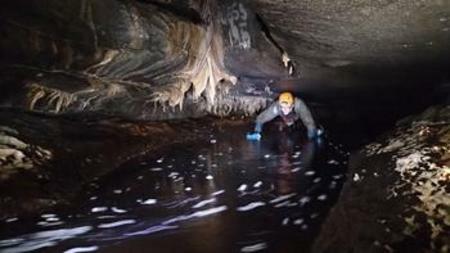 Next year we hope to continue previous efforts in the Coolagh River Cave and further progress our survey of the cave. We also hope to continue, and possibly complete, work from this year in Cullaun One. The club would like to thank the Alumni Foundation and Tratman fund which continue to enable us to carry out this expedition.